I read this book via the NetGalley, thanks to Truly Bookish in http://trulybookish.blogspot.com/ and her valuable advice. I was enchanted by this book, which takes place alternatively in the high seas, on a deserted island and on a pirate ship. It is the story of a very unusual heroine and a very unusual hero. Hope is sold into slavery on an island in the Caribbean after being betrayed by the man she thought loved her when she was attempting to run away with him. Nathaniel, the hero, rescues her and proceeds to help her to go back to her home, in Charles Towne. That's when their adventures begin, as the ship they are on is shipwrecked and then they are set upon by pirates. What was so unusual about the hero and the heroine was that they were realistic people with very few redeeming qualitites. At the beginning I was terribly frustrated by Hope, who is constatly flirting and behaving like a spoiled, immoral brat while getting everyone around her into trouble and then more trouble. I was also angry at Nathaniel however, who behaved in an ungentlemanly way towards her and seemed to resent every time he saved her even more than the last. He was also flirting with another woman throughout the book, which was really unfitting, since he was supposedly a christian and at the same time falling in love with Hope. Anyway, through their sparkling adventures, these mismatched people along with a crew of secondary characters discover themselves and God. And that changed everything. It changed them, it changed their relationship to one another, and it changed everyone around them. That's what I adored about this book, besides the wonderful adventure and the breath-taking romance. God is really present in this book and I learned a lot for myself, about my personal relationship with God. I felt as if this book was full of lavish, vibrant colours, what with all the adventure and everything, and full of tender hues because of the beautiful romance. It also had depth, which is something that I haven't found in christian fiction books recently. These were real people with actual flaws that didn't behave as if they belonged to a book, but would remind you of someone you know, or even yourself. 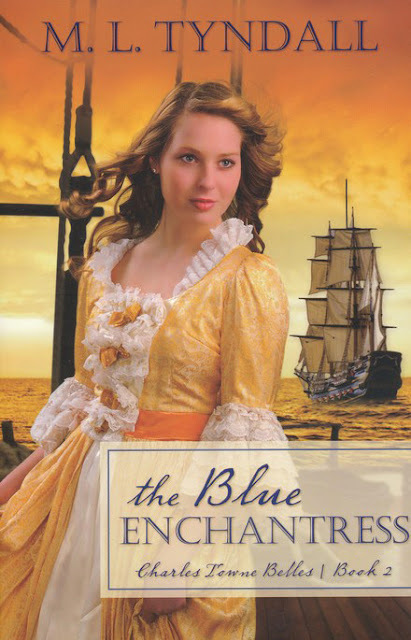 This is the second book in the Charles Towne Belles series, and I have read the first, The Red Siren, however I wasn't as esxited about that as I am about The Blue Enchantress. If you are interested, let me know, and I will review it, too. I am thinking of buying this book so that I can have it in my bookshelf. I suggest you do, too. Hi Alexandra, I have not had the chance to visit your blog in like two weeks, but I am so happy that you subscribed to NetGalley! You have reviewed some awesome books, I am catching up on your reviews now!